Dr. Heba Elkassaby teaches students how to use digital technology to improve their work. Dentistry is being revolutionized by CAD/CAM technology, but traditional techniques are just as important. That means RSDM students are in the unique position of drawing from the best of both worlds: analogue and digital dentistry. Problems associated with conventional methods: Messy impressions, discrepancies between patients’ teeth and dental models, tedious lab procedures, can be avoided with optical impressions. But its critical for students to learn both ways of doing thing. “Conventional techniques are the fundamentals. Digital dentistry makes no sense if you don’t have that other knowledge,’’ says Dr. Heba Elkassaby, Chair of RSDMs Advanced Digital Technology Committee and Assistant Professor in the Department of Restorative Dentistry. In the past year, RSDM has made great strides in keeping up with a rapidly changing profession. The school is in the midst of a three-phase effort to add new digital dentistry resources on the clinic floor and in the classroom. 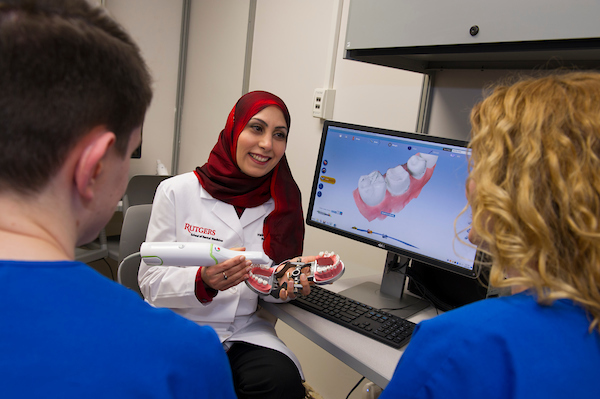 Students now work with intra-oral scanners, which can duplicate a patient’s dentition within minutes onscreen. Preclinical computerized self-assesment technology helps them learn by precisely measuring student tooth preparations against an ideal preparation. Last year, RSDM began the project to greatly develop its digital programs, purchasing Preclinical oral scanners, clinical scanners, computerized assessment laboratories, and 3D printers donated by Stone Glass Industries.